March, 1996. FBI agents Mulder and Scully pull up to a ramshackle warehouse along Seattle’s waterfront. Mulder defeats a suspiciously new lock on the rusty front door and the agents enter an open, barren storage area. They discover a pool of fine black powder on the ground, which interests Mulder. As he sifts through the powder, three men burst through the front door, all firing handguns. Scully is hit in the arm while Mulder dives behind some crates and pulls her to the floor. As bullets fly overhead, a blinding white light washes over the area and quickly fades. Mulder pops up from the crates, gun ready to return fire, but he freezes. There’s no more gunfire. You can see by his expression that whatever he sees where the men used to stand is astonishing, and frightening. Jordan Lee Williams as Craig Willmore. Looks a bit like a young Chris Penn, he does. 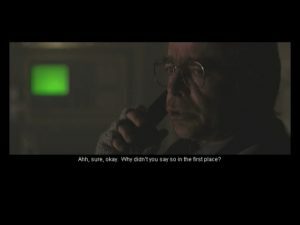 The X-Files game is one of the last FMV adventures a studio attempted, and possibly benefiting from previous experience, one of the best. You play as Craig Willmore, an FBI agent in the Seattle field office who spends his days busting counterfeiters, drug runners, and militias – you know, what the FBI’s supposed to do. As the game begins (taking place within the show’s third season), you’re called in to help a certain Assistant Director Walter Skinner find two screwballs named Mulder and Scully, last seen in the area. As the case proceeds, you learn that they were on to something huge that has dangerous implications for national security. Pretty soon, you’re spiraling deeper into the world and mythos of the show. 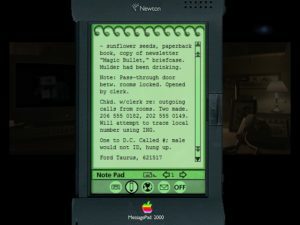 Making a game out of The X-Files was really just common sense in the mid-90s. Making an FMV game, despite the genre’s many flaws, is actually the only path worthy of the show. Since the game is based off a TV series with an established look, FMV is the only way to truly bring that beloved mood and style to a game. There’s a big draw for fans looking to play an interactive episode of the show, or for adventure gamers looking for a title with production values closer to a film than the cheaper green screen productions of previous FMV adventures. The X-Files game doesn’t disappoint on either count. Simply put, this is one of the most impressive FMV games you can find. The quality of the video, audio, sets, and generally the acting, are simply astounding for a game. Everything is shot on-location in varying scenes and situations authentic to the show. Military bases, aircraft hangars, field offices, cargo ships; they’re all there and they’re all real. If realism was the entire point of FMV, then this is one of the few titles that spent the money to get it right. Shafts of light filter in through smoky warehouses in true X-Files style. An overcast Autumn day marks your investigation at Mulder and Scully’s hotel, and looks just as brisk and chilly as if you were there. You’ll even get a few requisite gun battles and honest pyrotechnics. 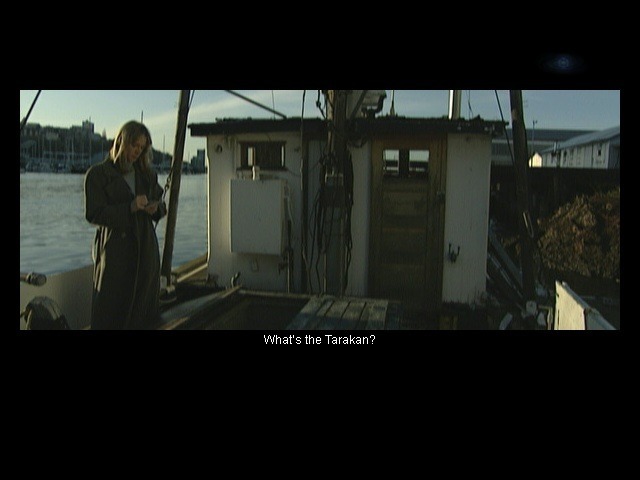 On an actual boat in Seattle (or likely Vancouver) with Craig’s adopted partner. Apparently, this is all due to using the show’s established crew in their off-season. They match the styles of game and show with practiced aplomb. When you combine this superb source with some pretty detailed digital video and blending of frames to give motion (so water ripples, grass sways, people shift around nervously, very little stays frozen in place) then you have a convincing interactive experience that matches the show as advertised. The only fly in the coffee is that while the production value for a 90s game is phenomenal, it’s pretty cheap compared to the show. Many stages overuse fog as an effect (the FBI office for one looks like eight people have been chain-smoking for hours), causing much of the digital video to look overly blocky. Many sets look more barren than a real location would. Also, the cinematic style isn’t quite as sharp as the show. Camera moves are often awkward, and unlike the show, this was clearly not shot on film. It suffers from that 30 fps “video look” that, despite the best intentions of the cinematographer, makes many areas of the game look like a high school video, or something hurriedly and cheaply shot by a couple guys before the cops show up. Fortunately, the authentic locations and killer lighting take your mind away from this in the game proper. Supporting detail throughout is extraordinary, especially related to the character you play. The manual gives you a brief backstory, but even without it, you get a crystal clear sense of Craig Willmore through his office and apartment. You can look at journals, divorce papers, family photos, drawings from his daughter, see that he likes the Civil War and the Ramones, find the box of Quisp in his kitchen cabinet, and even read an entire short story he wrote that was rejected by a fictional fiction magazine. 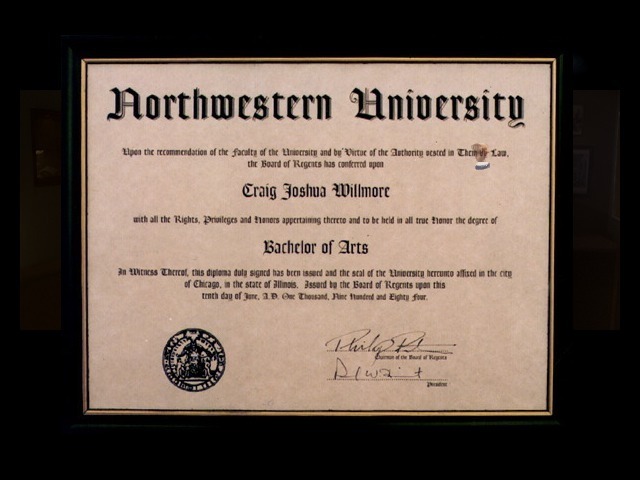 He’s got degrees, previous cases, a family, and a past. The fact that none of this really plays into the investigation at all, it’s just optional backstory, makes the care taken even more impressive. Nope, nothing creepy or suspicious here. This level of character and object detail continues into the actual investigation, with authentic forms, envelopes, reports, etc. The series has always shown a respect for the government and legal worlds, or at least a passionate desire to represent them accurately, and this carries over into the game as well. The evidence you’re presented with looks totally authentic. There’s even logs written in Russian, and UFO newspapers with complete articles to read. They clearly went above and beyond the call of duty in creating these pieces. The game is played through standard adventure rules and interfaces. Your main window is a first-person view of the scene. Moving the mouse triggers context-sensitive icons for movement, closer inspection, or talking with characters on-screen. Your inventory is held along a bar at the bottom that can be set to auto-hide for a proper cinematic experience. Right-clicking on any inventory item examines it, left-clicking sets it as the active object that can be used on the environment. The appropriate action will always be automatically selected as the cursor passes over the object you can manipulate. The only exception is in using items from your inventory – if it’s not the selected item, the action icon for it won’t appear. Talking brings up a window of possible topics, and occasionally, you can click on tiny movies that trigger responses based on moods (joking, distrustful, etc). These are rare, and even when they do show up, are frequently optional. Don’t choose anything and the game treats your inaction as a response. Allegedly, there are three different paths the game can take, dictated by your choices and attitudes here. These lead to three different endings, with the worst (best?) ending exploring more of the show’s mythos and earning you your very own visit from Cancer Man. Difficulty is highly adjustable, and the game is literally as easy as you want to make it. Overall, it falls into an average adventure difficulty with a typical number of confusing “what do I do next?” areas an the occasional pixel hunt. But if you need help, your in-game assistance is clear and multi-layered. First, you have the standard tools like an auto-updating notepad (to check and see if you’ve made progress) and a superior officer back at HQ who will look at your notes and offer hints about what you’ve missed. 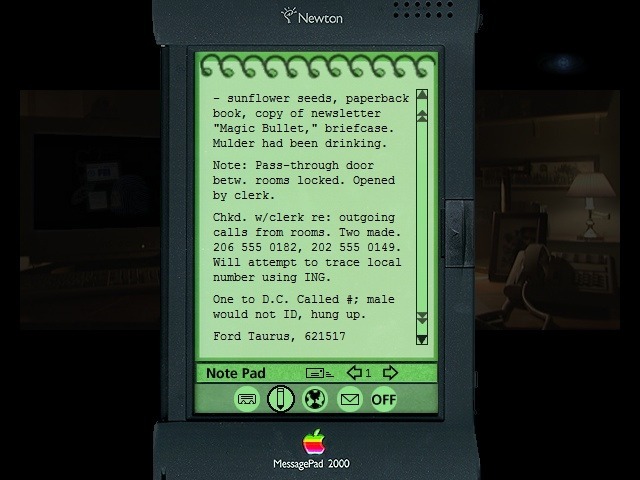 You’ll keep your case notes on a cutting edge Apple Newton. If you need more, you can turn on an “Artificial Intuition” option. This places a blue orb in the upper corner of the screen that lights up to indicate nearby clues and swirls if you’re on the correct screen. Need more help? Click the orb and you’ll be shown where the object you need to find is, or see windowed video prognosticating your next correct move. Not enough? Keep clicking and the game will eventually just complete that action for you without penalty. There are some action scenes, including the chase and shooting gallery variety. The shooting sections aren’t particularly twitch-based, so there shouldn’t be much of a problem getting through them. The chase sections are strictly trial-and-error. You have no way of knowing which path is correct before you try it, or some complicated maneuvers may require a few attempts to get the exact order of moves down. All of these sequences kill your character in the event of a mistake, but also allow you to restart at the beginning of that section without having to load a saved game. This limits the frustration to tolerable levels, but be prepared for some light annoyances. It’s still possible to get stuck in the investigation though, and have to resort to the “try everything” approach. There’s a clear, linear path you’re expected to take (like finding all the clues in the warehouse in one trip). If you manage to follow it, you’ll be fine. If you complete parts piecemeal or out of order, then you’ll later have to do odd things to trigger events that allow you to continue. Best example: your partner comes to your desk to ask if you need help after you complete a certain amount of the investigation. If you’re playing this “as intended,” or more appropriately, in order, you’ll naturally be sitting at your desk looking up information on the computers, and he’ll seamlessly drop by. If you’ve broken the expected pace, now you’ll have to go and sit at your desk for no reason at all (and with no hints to do so) so that this important scene can get triggered. These are the only areas where you might need to crack open a walkthrough. No! Frohike! Don’t hang up! We… uh… we’re cool! We totally know Mulder! The infamous 7-CD package sounds terrifying, but is really pretty painless. You’ll always move forward through the CDs, and will never have to swap back. The massive collection also allows for excellent, screen-filling video. It is widescreen, which matches later seasons of the show, but it’s not shown in your typical postage-stamp view. There are also light scanlines, but these are nowhere near as distracting as they are in Spycraft. With the inventory set to auto-hide and all hints off, you’re mostly looking at a widescreen view of the movies and the game interface that mimics a DVD presentation and looks pretty damn terrific. Audio also holds up well, with clean dialogue, effects, and ambience. Some of the lines are cheesy, and Mark Snow’s background compositions are underused, but there’s not much else to complain about. The whole game is great fun for fans, and nods to the show abound. Aside from the obvious ones like working (albeit briefly) with Mulder, Scully, Skinner, and the Lone Gunmen, you also get little references like a call from Agent Pendrell, find a copy of Jose Chung’s “From Outer Space” (and even read a few pages), see the Keystone Kops movie from “Syzygy” on the TV, find a nasty pile of sunflower seed shells in Mulder’s room, and encounter Morley’s cigarette butts just about everywhere you go. The options even include a “Subliminal Messages On/Off” choice, if you want to receive suggestions as to how to feel during certain scenes. I can’t say exactly what this does, or what the messages are, or if it’s just a joke, because there’s no way I’m turning them on. There’s no punchline there, I’m seriously not about to do it. I don’t even believe in subliminal messages, but after X-Files episodes like “Wetwired” and “Blood,” I’m not taking the chance in an X-Files game. It wouldn’t be polite to refer to these two as “low rent Mulder and Scully,” so I just won’t say anything. Now you may have noticed something that was a major complaint when the game was released; you can’t play as Mulder and Scully, and are relegated to inhabiting the body of some no-name gumshoe. The game was being made around the same time as the feature film, so Duchovny and Anderson were pretty damn busy. It’s unreasonable to expect them to dedicate the necessary time to this project, and for Fox Interactive to dedicate the necessary funds to their wallets. Unfortunately, the comparisons – complete with dueling believer and skeptic characters – are simply unavoidable. Fortunately, the character of Craig Willmore is actually perfect for newcomers to enter the world of the show, and for fans to rediscover what they love about the series from the perspective of someone coming in fresh. Fans already familiar with the show and its “rules” will have to allow Willmore to make some rookie mistakes, as his character doesn’t know any better. This can be a little grating, since it takes control out of your hands. But luckily for everyone involved, he learns pretty fast. Even if you’re not interested in, or have no prior knowledge of, The X-Files, the investigation as a whole comes off as a well-made and realistic detective adventure. You should certainly prepare for the spooky and the paranormal, but none of the topics change how you control the game and unravel the well-planned mystery. Bonus points if you’re either a fan of adventure games or a fan of the show. Worthy companion of the show, interesting story, and one of the few titles out there that does FMV right. 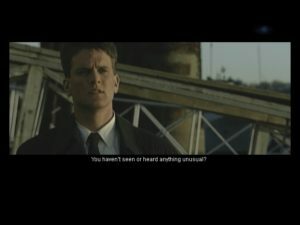 Beautiful FMV seamlessly executed. Enjoyable storyline for fans and non-fans that explores the X-Files mythology while offering an intriguing mystery as well. Impressive detail throughout. Willmore is a fine adventure game hero. You’re still playing a character instead of yourself (and so are sometimes forced into bad decisions), and that character is neither Mulder nor Scully to boot. Little short for 7 CDs(!! ), but still a good 4-5 hour run. The subliminal messages can be seen so they’re not really subliminal, they flash quickly but they’re not invisible. They say things like “madness” and “paranoia” and things like that randomly during the game. I think they’re there to make you wonder about what’s going on in the scene. Like if you’re talking to someone and you see “trust no one” flash across the screen, you might think twice about believing what that person said, or it may be trying to suggest not telling that person too much. Not really sure. But it’s nothing to worry about and you can see them every time.